Happy 2015. I hope the start of the new year finds you well and vice versa. As predicted, the start of 2015 has jumped off, music production-wise, as expected. Most of you know, the debut release by AfterSix Productions (Dan and I) What Love Is, is available on Bandcamp, another CD recording project for the band I play in, Divine Intervention, is underway, I’m tightening up some tracks for a show that will be “airing” on FB this quarter, along with a few other things. 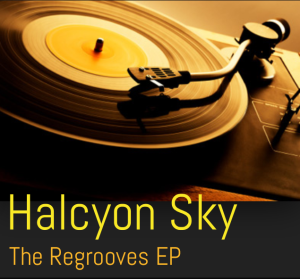 This post, obviously, as about the upcoming release: Halcyon Sky – The Regrooves EP. This morning I had a great conversation with one of the remixers about the status of the remix he’s working on for the project. He began to tell me about how this opportunity really stretched his ability as a producer, made him realize the criticality of how he sees his work, wanting to make sure the vibe of the track fit the essence of the project, etc. These things were not foreign to me at all because I’ve often had the same thoughts when produce music to be used in other capacity, let alone just listened to and hopefully enjoyed by the masses. Within the discussion I had learned the track was already delivered to me on New Year’s Eve, but I hadn’t checked my email to know it was even there. I shared that a big aspect of releasing Halcyon Sky was to meet my own deadline and achieve the goal or releasing the product as planned. The remixer also shared that it was a driving factor in getting it to me when he did but like all conscientious artists, he is very critical of his work. I asked him if he wanted more time to submit a new track. He accepted but asked me to listen to what he had submitted first. I assured him I would, but that I was certain I’d like it because of the time I took to listen to all this particular artist had shared on IG videos, YouTube videos in terms of music snippets he’s composed. In addition, his posts showed his passion for creating music in the genre he likes most – all that played a part in me choosing him for the project. This entry was posted in Music Production/Studio Recording, Remixing and tagged EP, Halcyon Sky, Music Production/Studio Recording, regroove, remix, remixing. Bookmark the permalink.